Such peace! Beautiful old farm on a domain of no less than 5 hectares, consisting of meadows, woods and a swimming lake at 1 kilometre. 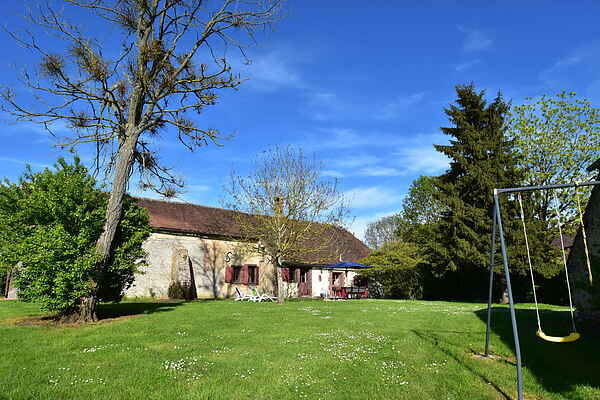 Neat, detached holiday home with a rural interior on the border between the Loire and the Bourgogne. Living room with large, lazy seating area and the ceiling consists of authentic wooden beams. Those who enjoy peace and quite and plenty of space have come to the right address. In the evening you will enjoy the beautiful sunset. The friendly owners live a little further along on the estate (not in sight). There's a bakery in Saint-Maurice-sur-Aveyron (6 km). Large supermarket in Chattilon-Colligny (12 km). In beautiful Montages (32 km) there are many bridges and the church of Sainte Madelaine, the Château Royal. A boat trip along the Pont of Briare (37 km) is very impressive. The Château de Guédelon (40 km) is a unique attraction. Approximately 50 craftsmen built a castle following the authentic, medieval methods. The famous Chablis wine is made here, so don't forget to take a bottle home with you. Swimming pool in Charny (15 km).